Hmm…this is a dumb game. I can’t even hear you. Oh well. The answer: ME! After heading down to Sebring, FL with The Getaway Girl and meeting her family (Who, I’m told, were pretty leery of homeless folk crashing their lodgings…until they met me.) 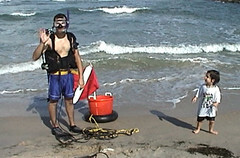 we borrowed her dad’s SCUBA gear and shot east to Fort Pierce. The easiest option was to dive from shore so after lying on the beach for a while trying figure out how I wanted to shoot the madness I handed the camera off to GG and started to suit up. It was a nice change from the Pacific Ocean in that stepping in the water didn’t instantly make me cringe and scream like a little girl from temperature shock. I didn’t even have to wear a wetsuit, which was kind of a novelty for me. Eventually I managed to get my gear on (including flippers) without falling down and high step into the waves like an idiot with the entire coastline watching the one guy in SCUBA gear wondering why he’s planning on diving in murky water with a lobster basket tied to him when there have been Bull Shark sightings all week. Well, duh. Because he’s an Amtrekker. The water was super cloudy and visibility was down to a few feet but the water felt incredible and it was such a beautiful day that it didn’t matter that much. I caught sight of a couple small fish, a drainage pipe and (just in time to have the surge throw me into them) rocks. I came out of the water satisfied, dry mouthed and bleeding with a smile on my face at the thought that I’m literally, after almost a year and a half of the most time consuming “work” I’ve ever had to do, only ONE single, solitary item away from my first opportunity to see home again! I am SO stoked people! Party’s at my place. October 25th. Clovis, CA. Be there. Hey brett… when you raise your arm up like that, the general idea is that youre supposed to flex. Just a tip for next time. Hmm.. very nice outfit.. Are you working out before diving?